November 13, 1856, on a farm near South Whitley, Indiana. Birth name: Mary Jane Wilson. September 3, 1913, at the home of her sister Eliza Ann (Mrs. Jonathan Ulrey), South Whitley, Indiana. South Whitley Cemetery, South Whitley, Indiana. Jennie was the daughter of Robert Wilson & Mary Frances Russell. The 1870, 1880 & 1900 censuses show her family in Cleveland, Indiana. Jennie was afflicted with a spinal condition at age four, and spent her life in a wheel chair. She was baptized in 1881, being carried on a chair to a tree shaded stream. She said of the experience, It gave me much joy to thus confess my dear Savior. She never attended school, but was educated at home. Her first poems appeared in a local paper. Later, through the influence of Reverend Jacob D. Coverstone (1847–1930), she sent hymns to a publication in Dayton, Ohio. Miss Wilson shows no trace of invalidism in her literary work. One of her poems entitled, A Memory Picture, is an exception. It refers to scenery near the old home, and alludes to memories of the days when she could walk. 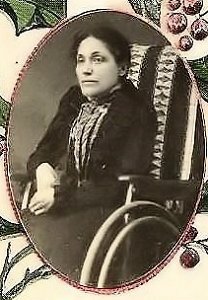 Even though wheelchair bound, she enjoyed attending Bible conferences at nearby Winona Lake, Indiana, and other locations. Are You a Soldier of the Cross? Are You Acquainted with Jesus, the Friend? Are You Enrolled in the Army of Right? Are You Striving to Be Faithful? Are You Traveling Home in the Only True Way? Are You Weary of Bearing the Burdens? Are You Weary of Your Wandering? Brother, Are You Now Retreating? Can We Count on You on Our Side? Can You Sing, Gladly Sing? Can You Slight the Loving Jesus? Do You Seek the Golden City? Have You Enlisted for Jesus? How Are You Building, My Brother? How Are You Dealing with Jesus? Is There Anyone Here Who Is Wayworn and Weary? Is Your Lamp Burning Low, My Brother? What Kind of Seed Are We Sowing? What Will You Do in the Solemn Day? Where Is Your Treasure Laid Up, Brother? Who Can Take Your Guilt Away? Why Are You Waiting Out of the Kingdom? Will Joy or Grief Be Our Reward? Will My Name Be Found on the Roll of the Faithful? Will You Come and Journey with Us? Will You Come to Jesus with Your Guilt and Sadness? Will You Labor for Jesus in Life’s Wide Field?